Last fall I provided a series of informal reviews on navigation apps that could be used with a GPS equipped Apple iPad. That would be the Wi-Fi/Cellular version, which is priced at a $130 premium to the WiFi only model in Canada. In theory these apps should also work with the the WiFi/Cellular version of the iPad Mini and the iPhone. After using these apps last summer I suspect the screen size of the iPhone and possibly the Mini is a little too small to be practical if you are traveling more than 20 kph, at least in our waters where there seems to be a rock every few hundred meters. In theory, if not in practice, these apps are also available for Android tablets and phones. The basic Nexus 7″ tablet, available for about $250, has the advantage that it has GPS built-in, and represents a significant savings over an iPad with GPS functionality. The “in practice” comment earlier relates to the fact that not all of these apps are yet available in an Android version. All of the apps reviewed last fall have received updates over the winter. This review covers the changes in a general sense and updates my opinion of their value for my uses. A reminder, I operate a 21-foot Scout Dorado with a 150 hp Yamaha in and around Georgian Bay. There are a claimed 30,000 islands, and an estimated 100,000 shoals. We typically motor at about 40 kph to optimize travel time and fuel economy. Even at 40 kph things move by pretty quickly. Becuase we still have ice on the Big Sound I have only been able to ‘desk test’ the upgrades. Desk use of the apps is really quite important. I spend hours looking over the charts and planning new routes and destinations. Google, Apple and Bing maps are well short of adequate when looking beyond where roads run, and available nautical charts are generally not detailed enough once you go off the charted courses. Paper charts also don’t zoom or scroll very well, although they do rotate very nicely. The bottom line in my opinion (details follow). This app has made some changes in their app, but nothing that really makes a difference in my life. Although it’s not the cheapest it represents the best value in my opinion with vector graphic mapping and very good accuracy in terms of markers. I was also encouraged speaking to an individual at the Toronto Boat Show in January who said Navionics is actively doing depth measurements in Georgian Bay to fill in areas with limited existing information. Those are exactly the areas that I spend my time, off the beaten track. This is a good application that is easy to use on the boat and when sitting at the desk. The standard chart package covers all of the USA and Canada, much more than I need, but I’ve actually had fun using it while on a 3-hour dinner cruise out of Philadelphia on the Delaware River. They recently announced a major overhaul of their interface. I guess it’s actually different, and presumably improved, but it really hasn’t registered with me. I have a couple of beefs with this app. 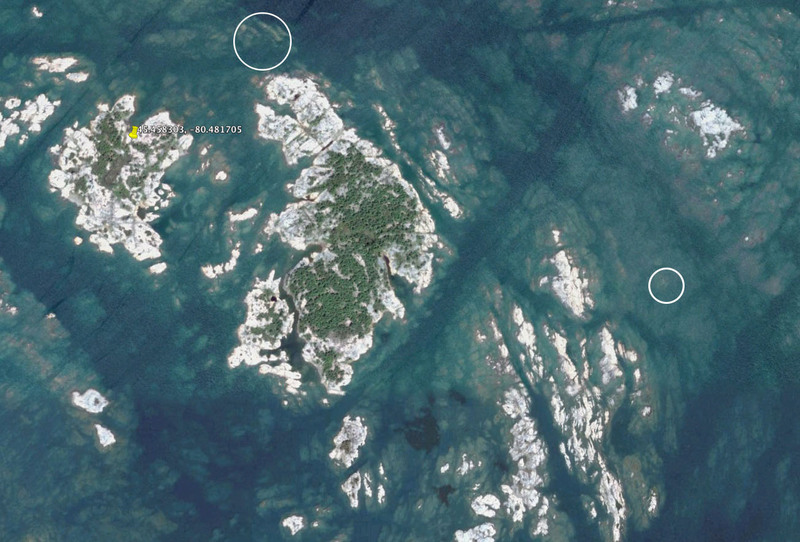 The first is that it is missing markers in an area I regularly boat, the area outside of Regatta Bay in particular. I’ve spoken with them in the past and they added in the markers outside of Snug Harbour but are still missing Regatta Bay. If these markers are missing what else do I need to be worried about? The second issue concerns the mapping when I’m sitting at my desk and ‘snooping’ around for new destinations and routes. It seems the variously scaled charts maps don’t overlap properly and it just looks strange. This gets to be a real problem with the Mink Islands where actual islands are missing if you have the view at the wrong scale. It’s not an issue of the scale being too wide, it’s just a glitch in the system. But this app is the least expensive and if the markers are correct in your part of the world it represents a bargain. Looking at the app again as I sit here writing this post I’m finding the app to be quite buggy, not only is there a misalignment of the charts, the markers come and go as I pinch to zoom in the various areas. The markers are visible when zoomed out but not zoomed in. I see that the markers for Regatta Bay are now shown, but only if you are zoomed out sufficiently. Zoom in and they are gone. Regarding the chart misalignment, here a screenshot showing the problem (click on the image to see a larger version). This was my first app for the iPad. It matched up with the strip charts. That’s a virtue and a real liability. The benefit is familiarity but your are limited to the strip charts. If you want to head a couple of kilometers off the charted routes you are on your own. The charts are not vector based, so there is a real limitation on zooming in on the details that don’t exist with the other two apps. Price is also an issue, for two reasons. The first is the $120 ‘start up’ cost to get just the Georgian Bay charts. It’s probably cheaper than the paper charts, but I still need to carry the paper charts if I’m boating commerically. And then there was the mid-winter upgrade. You know how it works, you get a message that an app has been updated, click here to update. Well I did just that with the iNavX app, which uses the Fugawi X-Traverse charts. When I then opened up the app all of my charts were gone. Gone! Not only was the app updated but my original charts were removed. I realize that I am not eligible for updated charts (things don’t change much in these parts), but delete the charts that cost me $60? My paper charts don’t disappear when there are updates. I contacted the company and was told I could get the updated charts for $10. Well that’s not too bad, but I still haven’t done it yet. I probably will pay the $10 to have them and salvage something from my original $120 purchase, but I’m still ticked off. Please, let me know that I’ll lose all of my charts if I choose a ‘free’ update. I was perfectly happy with the previous version of the app. So there you have it, a users opinion of three navigation apps for the GPS equipped iPad. I may decide to try the Navionics app on my Google 7″ Nexus tablet (2013 version) but that promises to set me back $55 plus tax. It’s hard to rationalize when I have a paid-for 3rd Generation GPS equipped iPad sitting in an Otter Box. The Nexus is very useful when traveling in the car and you use it to complement a Garmin GPS system. That involves about a $2 investment in downloading road maps to the Nexus that can be used offline. 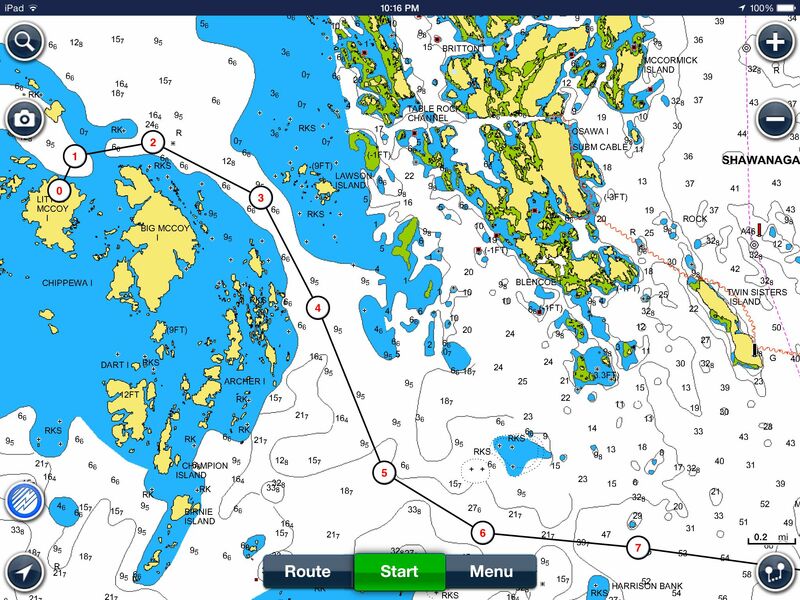 The last post covered the iNavX app from GPSNavX and the Georgian Bay charts from Fugawi X-Traverse. 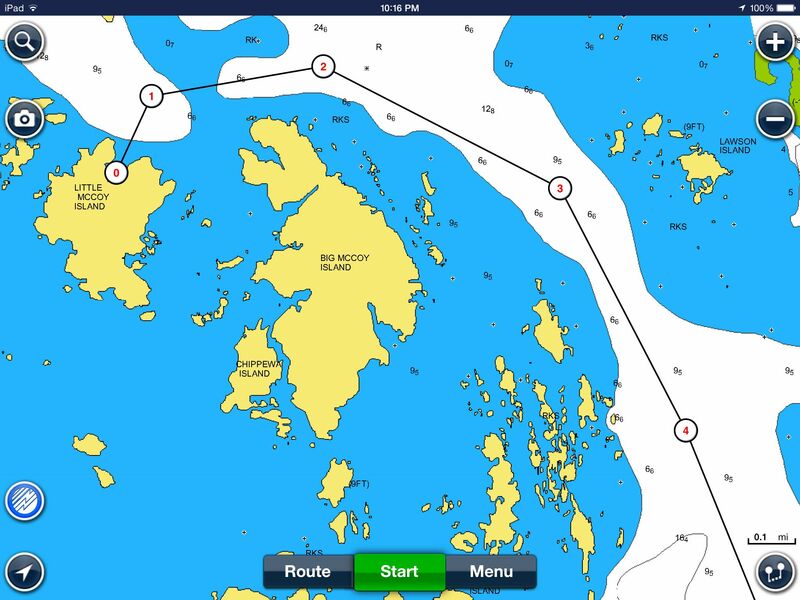 In this post I will provide a concise review and opinion on the Navionics app for the iPad as applied to the Georgian Bay area. I am using this app with a 3rd Generation (Wifi+Cellular) iPad. To allow for a better comparison with the iNavX app discussed in the last post, and the iSailor app that will be presented in the next post, I have included a short video demonstration of how the app looks and operates. Price: $54.99 for app including the charts for the USA and Canada. Annual updates are also $54.99. This has become our ‘go-to’ charting app when heading out on the Big Sound outside of Parry Sound, Ontario. It just works and the interface is pretty simple to figure out. Because I don’t use it every day, I’m not out everyday and there are times I’m boating in areas I am very familiar with, I sometimes need to poke a couple of the icons to remind myself with what is what. It’s really excellent when used at my desk to plot a course and to figure out where to go with clients. 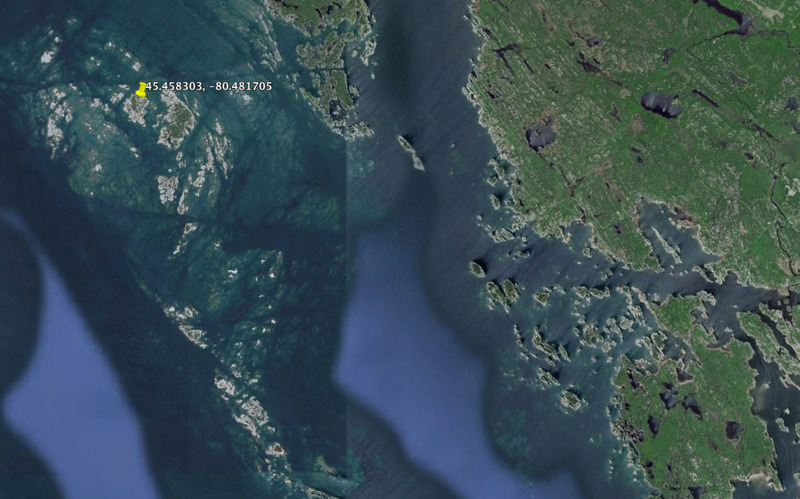 I can pinch to zoom and scroll everywhere in Georgian Bay without needing to load another chart. The video below provides a ‘slice of life’ regarding this app. The video covers many of the same topics that were discussed in the previous iNavx video and highlights the pros and the cons of the Navionics app. 3. It allows for the simple plotting of a course as you can see in the video. 4. Permits the setting of markers for depth areas. In our case we highlight in darker blue the areas that are 6 feet or less. 5. All charts for North America are included in the base price. This offers a real savings for the boater who likes to cruise longer distances when compared with the ‘area by area’ map charge with iNavX. The pricing is very reasonable for what you get, even if you only use a subset of the provide charts. iSailor similar to iNavX offers a la carte pricing for North American charts. 6. The Navionics app takes about 115 MB of space on the iPad versus 180 MB for iNavX and 57.6 MB for iSailor. Note that our iNavX installation only covers Georgian Bay, and our iSailor installation Lakes Huron and Superior, while Navionics covers all of the USA and Canada. I’m really at a loss to point out any cons. It just works. Sure it could be cheaper, but it still is a relative bargain in terms of what it does and its utility. We don’t need to deal with tides in Georgian Bay so perhaps it could be better in that regard, but perhaps it’s already pretty good, I just haven’t assessed it for this. Here’s a video that shows the Navionics app in action (in the office). I’m not equipped to do an on-board demo. It performs similarly when used on the boat. There is an HD icon in the top right area of the video, click on it to see a better resolution version. In the last post I provided a short overview of the three apps that I have purchased and used on my iPad (3rd Generation/Wifi+Cellular) for navigating in and around Georgian Bay. In this post I will provide a little more detail about the iNavX app including a short video demonstration of how the app looks and operates. 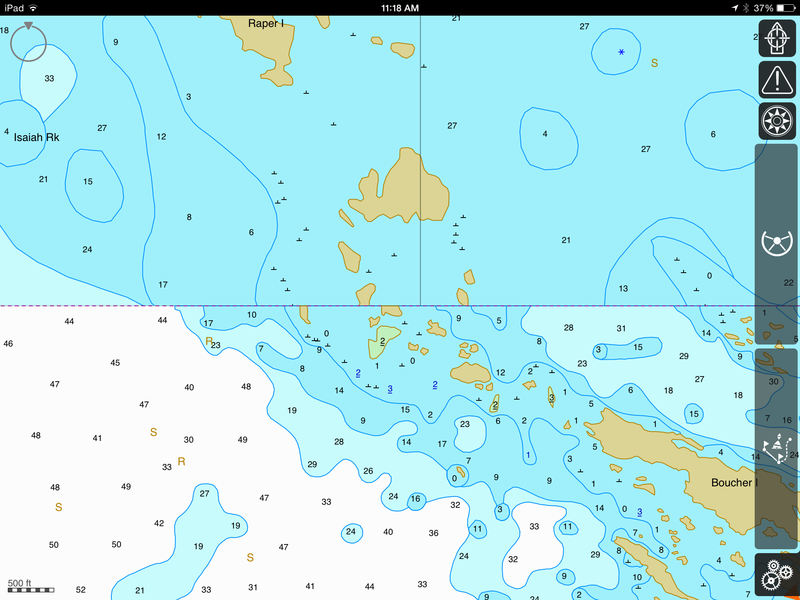 Price: $49.99 for app, $70.00 for electronic charts (Tobermory to Little current). The subscription allows for one year of chart downloads to as many as two separate devices, thereafter updates are $70.00. I worked with this app for most of last year before discovering the two other apps that are included in this Informal Review. It should be realized that the effective cost to use the iNavX app on the iPad is about $120 plus taxes. The basic app provides no charts as part of the purchase price. The charts are purchased separately from Fugawi X-Traverse (www.x-traverse.com). The video below provides a ‘slice of life’ regarding this app. In general this is not a navigation app that I use despite the relatively high price I paid for it. This of course is a personal opinion and I’ll share my thoughts on what is good and not so good about the iNavX app. 3. It allows for the plotting of a course, but this is not very practical as one needs to determine what chart to load next when plotting a course when in port or at home. 1. The raster graphics are pretty rough to look at. The charts are basically an image of the paper charts. As you zoom in everything gets larger, it’s much like looking at the paper charts with a magnifying glass. 2. The charts are all in separate files/folders, there are about 90 individual charts for Georgian Bay. The labels used for the different charts in some way relate to the labels used with the paper charts, but not exactly, and not intuitively. This can make it tough to figure out what chart you need to look at to see the continuation. For example the edge of one chart may indicate that the continuation is on Chart 2242, but it isn’t included in the package. In other cases the chart may indicate a chart number but it is not the same number as used by the X-Traverse charts. 3. 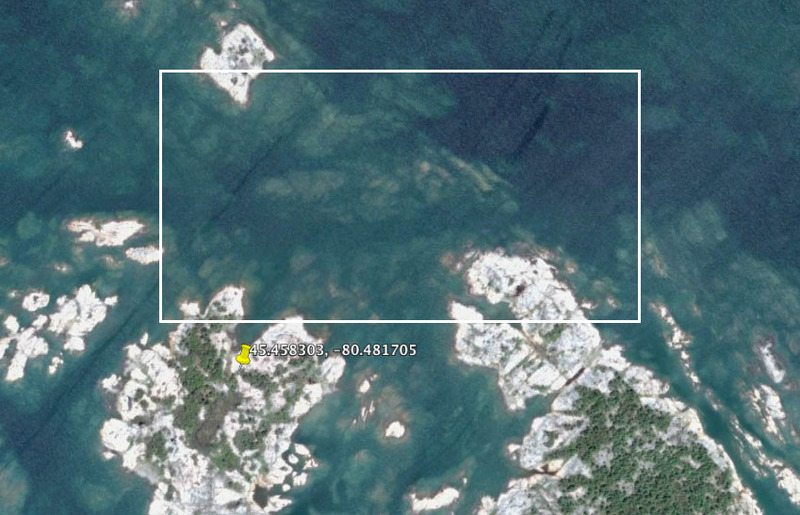 Not all the interesting areas of Georgian Bay are covered by the charts that are provided. For the most part the charts seem to cover the small boat routes. If you want to head out further there are no charts. And further out isn’t that far, for example I can’t easily find a chart that shows the Umbrella Islands, or the Snakes or the Limestone Islands. In most cases the provided charts with iNavX and X-Traverse just show the small boat routes and not all of the islands. You could not use this app to travel directly west across Georgian Bay from Parry Sound to the Bruce Peninsula. 4. The charts don’t scroll as you look at them when you are at home, or in port. To plot out a route or just check on where you might want to go you need to figure out what chart you need and then load it, and then the continuation chart. It really is not very easy. This is a very big issue with me as there are some 90 charts to select from. Once you are traveling and iNavX is plotting your location it will automatically scroll from chart to chart, so this is good news. 5. There doesn’t seem to be any way to set custom depths. In our case we like to have the six foot and less areas highlighted. Others might like the limit set to 8 or 12 feet. The iNavX charts do offer the standard paper chart colouring for shallow areas. 6. At $120 they are the most expensive by far. Here’s a video that shows the iNavX charts in action (in the office). I’m not equipped to do an on-board demo.